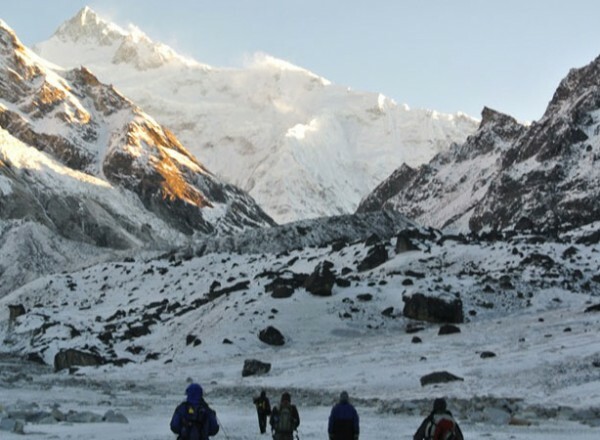 The Sandakphu Trek was established by the British during the Raj period. It was so popular that even the then Nawab of Hyderabad wanted to visit Sandakphu and Phalut to view the mountains. Since his physical condition was such that he could neither walk nor ride a horse for that distance, therefore, he paid the Public Works Department of the then Darjeeling to build a motorable road to Sandakphu and Phalut (21 km away from Sandakphu). The first vehicle to reach Sandakphu was in 1947. It was only after ten years, in 1957 to be precise, that the vehicles started to go to Sandakphu. Trekking into Sandakphu starts off from an altitude of 1,524 mtrs and gradually climbs up through forests of rhododendron, giant magnolias, spruce and other trees of sub-alpine and not to mention, more than 600 varieties of orchids the largest to be found in one geographical area in the world. The view of mountains from Sandakphu is unsurpassed by any other view anywhere. Day 01: Arrival Bhadrapur/Bagdora Airport and transfer to Darjeeling. O/N Hotel. Day 02: Early morning excursion to Tiger Hill to view sunrise over Mt.Kunechandzonga, the third highest mountains in the world. En route visit Ghoom Monastery and Batasia Railway loop. After breakfast full day guided tour of Darjeeling on foot for acclimatization before trekking. To you are being acclimatized at an apprx. altitude of 2,300 mtr. O/N Hotel. Day 03: After breakfast drive to Rimbhick (alt. 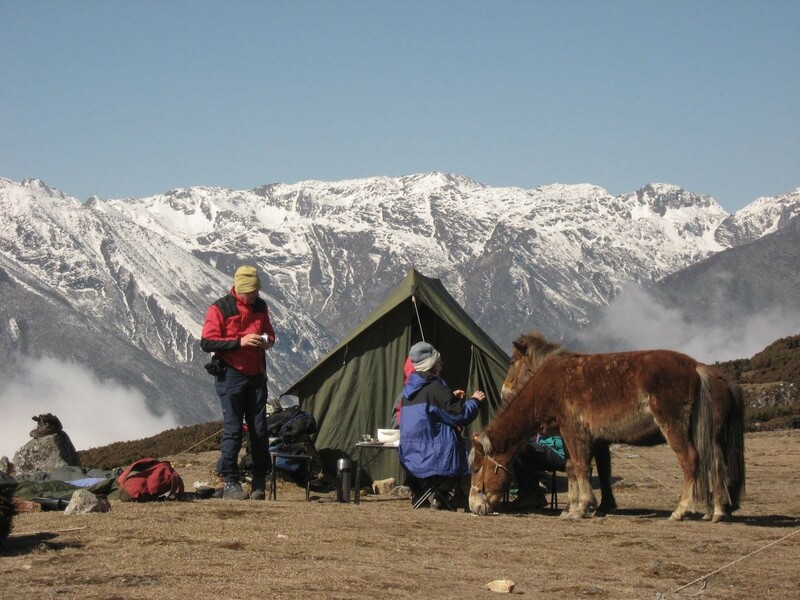 2000 mtr) – the starting point of your Singalila ridge/Sandakphu trek. The drive takes about 5 hrs. Rimbhick is a small trading village near the Indo-Nepal border. Meals and overnight at Shiva Pradhan Inn. Day 04: Trek to Ramam (alt. 2600 mtrs). Walking time apprx. 6 hrs. To-day from the very beginning of trek you will be walking through the rich emerald forests inhabited by hundreds of bird’s species and alpine vegetations. All along the trek route, one can experience total peace and tranquility and being close to the nature too. O/N trekker’s hut. Day 05: Trek to Molley (3535 mtrs). Walking time appx. 5 hrs. The day starts with three hour climb to the highest point – the Singalila ridge. One can see the gradual change in vegetation and altitude is to be noted. 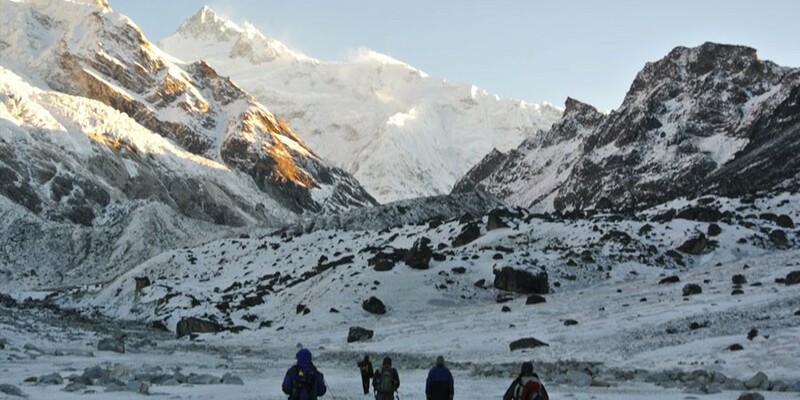 The first glimpse of Mt.Everest and Mt.Kanchendzonga ranges can be viewed from Molley to their most pristine state. O/N Trekker’s hut. Day 06: The walk of 3 hrs to the northwest point of the trek, not losing sight of the magnificent peaks and the rich abundant vegetation trail leads you to Phalut, the point of the trek, which forms the tri-junction of Indian States of West Bengal, Sikkim and neighboring country Nepal. O/N at trekker’s hut. Day 07: Trek to Sandakphu (alt. 4000 mtrs). The name Sandakphu implies the height of the poisonous plant i.e. aconite plants which grow in abundance. 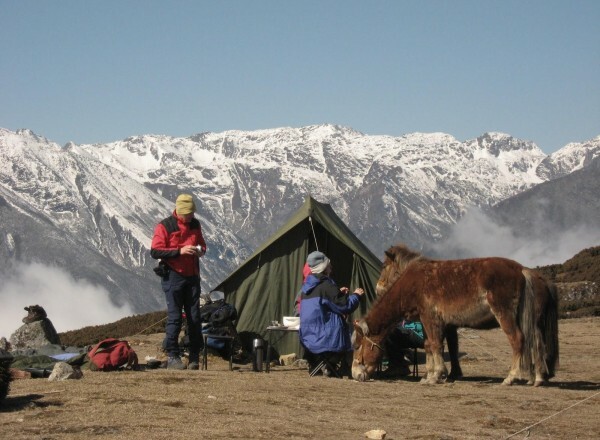 The place commands the finest view of the Himalayas and is called “trekker’s paradise”. O/N trekker’s hut. Day 08: Trek to Tonglu (3000 mtrs) about 5 hrs down hill walking through evergreen forests with abundant wild flowers. O/N trekker’s hut. Day 09: Trek to Maneybhanjyang. You will be walking for 3 hrs through dense evergreen forests and hillsides covered with wild flowers. En route you can have spectacular views of Darjeeling hills and Mt.Kanchendzonga. On arrival, you will be transferred to Darjeeling . O/N Hotel. Day 10: Drive to Bhadrapur or Bagdora Airport for your outbound flight.